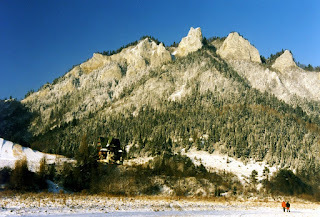 I spent an excellent week in the Pieniny range of mountains and national park in the Tatras in the south of Poland before New Year. Niedzica Castle was as wonderful as ever with French champagne (chilled Laurent Perrier NV - my favourite NV) on the high tower at twelve with lots of fireworks. Demanding walks up and down the rutted tracks on the pine-forested slopes of the park. Poland has some of the best hiking in Europe with excellent maps and clearly marked routes. The excursion into Slovakia was a revelation. This spectacular country is so seldom written about (only one Brandt Guide exists). Such picturesque landscape particularly the snow-covered High Tatras. Evocative wooden Orthodox churches dot this region - the finest collection in Europe. The originally 14th century unknown multicultural region of the Spis is fascinating. First to white Strazky Manor on the Poprad River, a 16th century Renaissance mansion where the French film director Alain Robbe-Grillet (Last Year in Marienbad) shot L'homme qui Ment (The Man who Lies). Then on to the Renaissance town of Levoca and Spis Castle. This monumental construction on a hill above a plain once seen can never be forgotten. Reminded me of Krak de Chevalier in Syria. Now back in Warsaw where it is -16C at night and -8C during the day under tons of snow. Very picturesque where I live in Mlociny. Deer feed daintily in the snow on the slopes near the Palac Bruhla before my writer's window. I am working hard on the Australian concert pianist book. Remarkable discoveries. Edward Cahill (see previous post) even played Chopin and Liszt in the Shagai Fort at the entrance to the Khyber Pass on the largest concert tour of Asia ever mounted at that time. It was organised by the impresario Frederic Shipman who managed the beautiful Annette Kellerman dubbed 'The Perfect Woman' as she had the exact vital statistics of the Venus de Milo. No not a fashionable shape today - more's the pity!